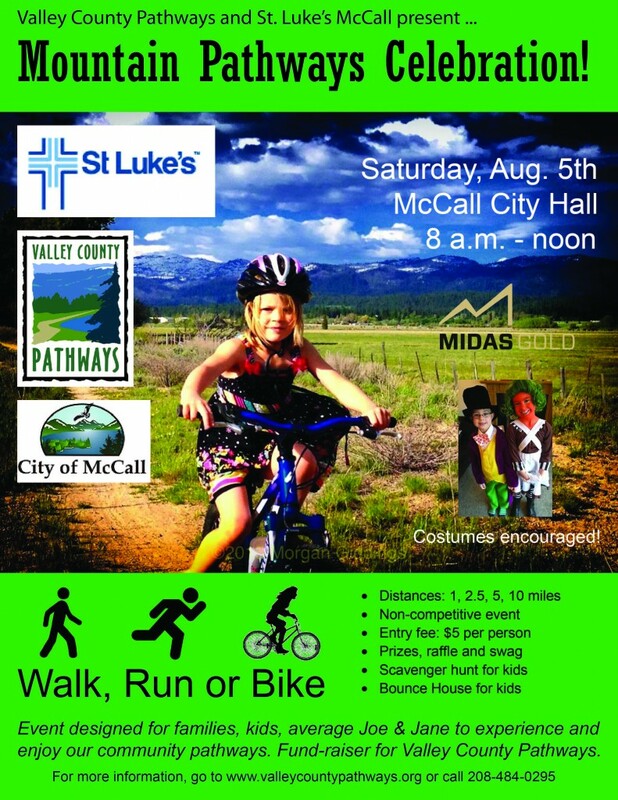 Mountain Pathways Celebration coming up Saturday, Aug. 5th in McCall! 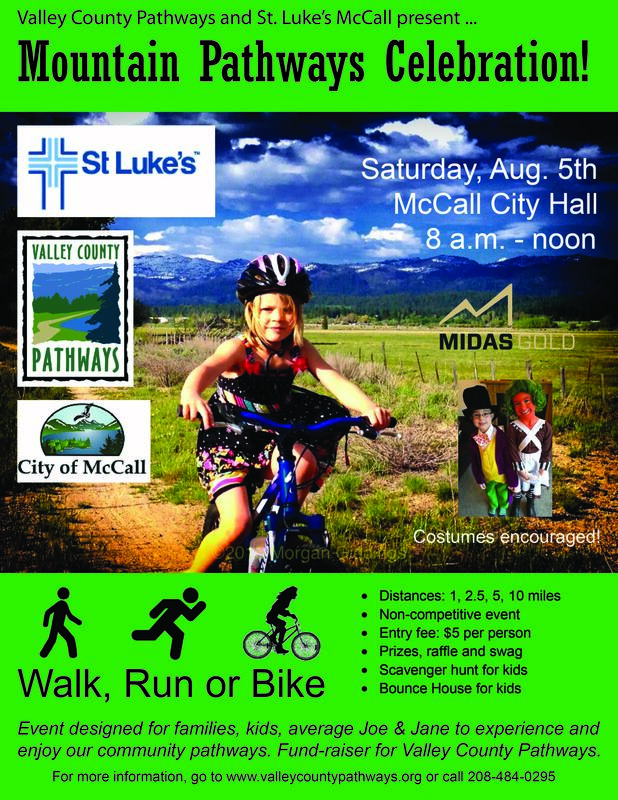 Valley County Pathways and St. Luke’s McCall are teaming up on a new event, the Mountain Pathways Celebration, on Saturday, Aug. 5th, 2017. For folks who might want to walk, run or bike 5 miles, they’ll ride a bus out to the south end of the North Valley Trail on Heinrich Lane, and enjoy a continuous 5-mile journey through the beautiful, tree-lined rural outskirts of McCall — passing by the Activity Barn and the McCall Airport — and then into the downtown area to the Start/Finish area behind City Hall. For walkers, we’re offering distances of 1, 2.5, 5 and 10 miles. Ditto for runners. Bicyclists can ride 5 miles from Heinrich into downtown McCall using the bus shuttle, or they can ride from downtown McCall and go out and back for 10 miles. The trail is nearly flat the entire way with a couple of short uphills and downhills. Very kid friendly for all ages. Seniors too! We want folks to have fun at this event! Costumes are encouraged. We’ll have music at the Start/Finish area. We’ll have coffee, fruit and muffins. We’ll have aid stations at every mile, with fun activities at each one. Scavenger hunts are planned for kids. Bounce house for kids. Entry fee is $5 per person. You can pre-register online. Same-day registration is OK too. Prizes: Bring a prize to share at the event … toys or stuffed animals for kids, used recreation gear, hats, whatever you think someone else might want! 8 a.m. Last-minute registration and liability release forms. Coffee, muffins and fruit for participants. Music. 8:15 a.m.-9 a.m. Start walkers and runners on 1, 2.5 and 5 miles courses. Shuttle walkers and runners who are walking or running 5 miles to the south trailhead. 10 a.m. Start bicyclists on 5 or 10 mile courses. People who wish to bike 5 miles will be shuttled out to the south trailhead. Please spread the word! Thanks!